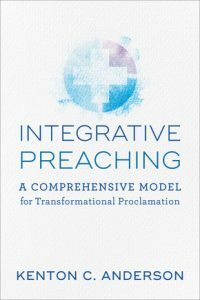 Anderson, Kenton C. Integrative Preaching: A Comprehensive Model for Transformational Proclamation. Grand Rapids, MI: Baker Academic, 2017, pp. 208 pages, $22.99, paperback. Kent Anderson’s contribution to the field of homiletics is multifaceted. In addition to authoring several books in the field, he has provided an online preaching resource, www.preaching.org, for more than two decades. Anderson describes his recent contribution to homiletics, Integrative Preaching, as his “most comprehensive [book]” and “the best that [he has] to offer” (p. vii). In the final chapter of his previous work, Choosing to Preach (Zondervan, 2006), Anderson introduced his idea of the integrated sermon. Thus, Integrative Preaching is the full expression of this homiletical model, and it is presented in the following four parts. In Part One, Anderson suggests that the imagery of a cross as the best way to understand his integrative model. Among various points, the cross shows the intersection of vertical and horizontal axes, and it pictures the addition of diverse elements without compromising the nature of each element. In this way, integrative preaching is “not a choice between options but the addition of one to the other – head plus heart and heaven added to the human” (p. 9). In Anderson’s view, “The cross aspires to a new and heightened form of unity, expecting something greater, beyond the possibility offered by less holistic [homiletical] options” (p. 6). In Part Two, the author describes four functional elements of his preaching model. Anderson writes that “the first move of a sermon is to engage the audience” (p. 45), and he contends, “The best was to engage listeners is to tell a story” (p. 46). Next, “the second move is to instruct” (57). At this juncture, biblical teaching intersects contemporary life. For its third move, Anderson asserts that “the sermon must also convict” (p. 67). The declaration of the gospel takes center stage here along with an anticipation of God’s transforming work in the lives of people. Lastly, inspiration comes into view for the fourth move. Anderson writes, “A great sermon will result in something … until the sermon inspires its listeners, it will be incomplete” (p. 77). In Part Three, the author discusses the homiletical materials and various postures preachers assume in communicating an integrated sermon. First, preachers present a problem with a pastoral tone. Thus, integrative preaching begins inductively. Second, the points of the sermon help listeners see how the biblical text addresses this problem. Here the preacher assumes the posture of a theologian. Anderson urges, “[Preachers] are not offering opinions … Our challenge is to read the text and discern its meaning by careful exegesis” (p. 99). Third, prayers are the main thrust at this stage of the integrative sermon. In this movement, the preacher functions “in the mode of the worshiper or worship leader” (p. 105). Anderson writes, “Preachers need to hear from God themselves” (p. 107), and with humility, “the preacher speaks in the voice of the fellow traveler, though as one a little further on the journey” (p. 108). For the final move, the preacher paints a picture in the mode of a prophet. A vision of the future is cast for listeners to see what God can accomplish for all who embrace His truth. 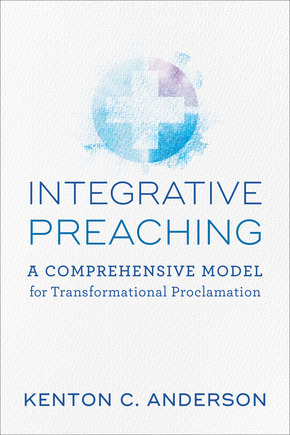 In Part Four, Anderson presents practical points for integrative preaching. He begins with guidance on identifying the biblical text and topic as well as pulling together ideas for the movements of the sermon. The preacher also distills the major theme for the sermon. All of this is developed with an eye towards the audience, since Anderson urges preachers “to read the text and to read the people” (p. 127). The author then addresses the assembly of the sermon which needs to be precise and intentional so that there is a strong unity and finish to the message. Anderson next challenges preachers to prepare for delivering the sermon in ways which move beyond mere rehearsal and memory techniques. Rather, preachers should strive for the message to become a part of them. The author explains, “If our sermons are not true to us in the deepest way, they will not be powerful for those who listen” (p. 148). Finally, preachers need to deliver the sermon. Practical matters here relate to the tone of verbal delivery, the physical posture of delivery, and the use of a pulpit and notes in delivery. In all these facets of delivery, preachers should seek to maximize the opportunities of specific preaching events. Anderson’s effort to present a holistic homiletical model in a single volume of less than 200 pages is an ambitious one. A strength of his model is the mixture of diverse elements. He constantly challenges readers to resist the urge to retreat to false dichotomies such as heaven or earth, head or heart, objective or subjective, etc. Yet, it is precisely at this point where a weakness in the book emerges. Its contents may overwhelm preachers with a deluge of details. For instance, when Anderson populates a pictorial representation of his integrative model at the end of Part One, twenty ideas flood the image. Yet, readers are only a quarter of a way through his book at this stage. At this juncture, Paul Scott Wilson’s counsel in Preaching and Homiletical Theory (Chalice, 2004) comes to mind. Near the beginning of Wilson’s survey of homiletical theories, he poses an important question about their utility: “Can a typical preacher readily understand a proposed method and implement it effectively?” (p. 21). Doubtlessly, Anderson has given thorough reflection in his book-length version of his initial thoughts concerning the integrative sermon. However, perhaps a more streamlined dispensing of its main thrusts might help preachers to implement it. Currently, readers will have to wade through the significant number of the moving parts in the integrative model as they cull from it some key ideas to use in their preaching. Consequently, Integrative Preaching will probably be most useful to seasoned preachers, since they will likely discern where their preaching is less than holistic in nature. They will also be aware of some of the basic homiletical building blocks for sermon development. For novice preachers, they would be better served by learning to first develop messages from the instruction offered in Bryan Chapell’s Christ-Centered Preaching (third edition, Zondervan, 2018). Towards the end of his work, Chapell offers the following wise homiletical counsel in relation to sermonic structures: “Just as a musician practices scales to develop the skills for more nuanced compositions, preachers who have knowledge and mastery of these basic components of sermon structure are best prepared to alter, adapt, mix, or reject them in order to take the approach most appropriate for their particular text, congregation, and circumstance” (p. 389). Interestingly, Anderson first illustrated the idea of the integrative sermon with musical compositions in Choosing to Preach. So, it would be helpful for beginning preachers to learn the homiletical scales of biblical exposition before trying to compose a complex sermonic score like the model presented in Integrative Preaching.